My sister turned 21 the other weekend and had a costume party to celebrate. Kelly and I went dressed as Vincent Vega and Mia Wallace from “Pulp Fiction” -- good thing my dad was there to recognize us, because none of the kids had any clue who we were supposed to be. Anyway, that left us daughterless on Sunday morning. Babycakes had spent the night with Kelly’s parents and we didn’t have to pick her up until after naptime, so we decided to take advantage of the situation and go out for breakfast. Kelly was surprised when I suggested we check out the new Succotash. She was a big fan of the old location in the River Market -- but the few times I went there a couple of years ago, I really didn’t like it. 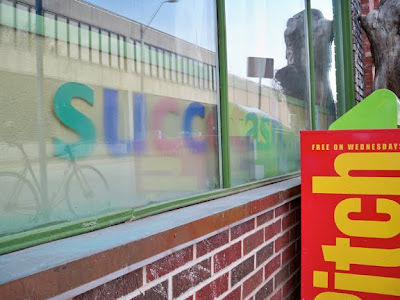 The place struck me as thrift shoppy, and it seems like my sandwiches were always 98% crusty bread, 2% fillings. However, I’d heard enough good things about the revamp that I was certainly willing to give the 4-month-old Succotash 2.0 a shot. 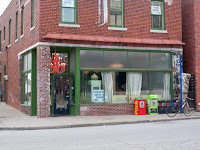 As soon as we walked in the door, we could see that Succotash has traded in the belabored kitsch for a more effortlessly vintage vibe. And even though it was fairly busy, we didn’t have to wait all that long to be seated and get coffee. Café du Monde is poured at Succotash, and it is one fine cup. Better yet, there was no slacking off on the refills, with somebody coming around to top it off pretty often. Looking down to reach for my coffee, I caught a glimpse of myself in the mirrored table and discovered that no matter what angle you look at yourself in it, you have a fantastic view of what’s up your nose. I ordered the Farmstand plate, which comes with eggs, home fries, bacon and your choice of toast or a biscuit. My choice was biscuit, add gravy. 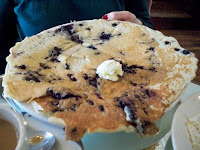 Kelly got the pancake of the day, and today that was blueberry. To make sure my wife knew what she was getting into, our server explained that at Succotash you only get a single pancake, but it’s super big. There’s a ginormous painting on the wall of a lady with tomato bisque dripping down her chin, and from where I was sitting I had a hard time not looking at it while we were waiting for our food. We’re not the first and we won’t be the last to observe that it looks like she’s enjoying a big bowl of blood soup. The painting was way distracting, even more so once Kelly started hissing “Brains!” at me all “The Return of the Living Dead” zombie-style. Just when we’d moved on to misquoting the “Pulp Fiction” diner scene to each other, our breakfasts arrived. Kelly’s pancake was indeed a monster -- it covered up her entire plate. Totally thick and chock full of blueberries. It almost made me wish I’d gone with my second choice, the Burrito of Love, which is a buttermilk pancake wrapped around scrambled eggs, bacon and cheddar cheese. 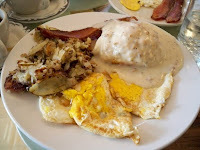 But then I would’ve missed out on the biscuits and gravy, and that would have been a tragedy -- this was some of the best B&G I’d ever had. The flavor was mysteriously like that of lightly sauced pizza. Seriously good bacon, too. I got a mean thing for lima beans, so I’m for sure going to have to stop in for lunch. Sandwiches come with a daily side. Is it too much to ask that when I return, maybe the daily side could be B&G? What this place needs is actual boxing. Or better yet, foxy boxing. 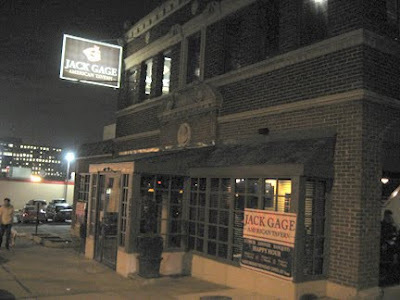 Having just reread Charles Ferruzza’s positive review of Jack Gage American Tavern in The Pitch when we were trying to settle on a location for Guys’ Night, I suggested the boxing-themed restaurant as a contender and everybody bought in. However, the agreed-upon date was still a couple of weeks away, and in the meantime my co-workers Sarah and Matt had started talking up Jack Gage even more. I couldn’t wait any longer, so I decided to stop in for lunch. Scott, Zach and Dylan joined me on the initial run. Overall, it wasn’t bad -- although the hostess led us by several open four-tops to seat us right by the kitchen door in the back room. Compared to the rest of the place, this room has about as much character as an unfinished basement. It’s like they experienced a sudden shortage of large wooden boxing murals, prompting them to just hang up a TV and reserve that section exclusively for shady looking riff raff, boisterous work group lunches and families with crying babies. I got the Flat-Iron Steak Sandwich ($8.99), and it was tasty despite the caramelized onions almost completely overpowering the steak with sweetness. Dylan ordered “The Upper Cut” Pork Tenderloin ($8.29) and liked it. And Zach and Scott got burgers -- respectively the Black & Bleu Burger ($6.99), and Jack’s Burger ($7.99), which is basically a bacon cheeseburger -- and while neither guy was crazy about their lunch, they both said their burger was good enough. So none of our entrees were big winners, but the service was friendly and there were enough intriguing menu items that I was looking forward to a return visit. On Guys’ Night, I arrived first and ordered a Boulevard Tank 7, waiting at the ornately decorated bar for everybody else to get there. This was really my first opportunity to check out the décor, which I’d remembered The Pitch marveling over, yet due to being in the back room didn’t get much of a chance to take in the last time. Not too much later, Robert, Voytek, Adam and Dorsett showed up and we were seated. Again in the back room. Must be something about the company I keep. In retrospect, I should’ve said something. There were so many different things I wanted to try, that Robert, Dorsett and I decided to split a bunch of stuff. 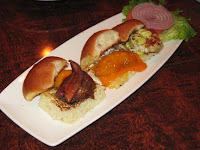 We were all agreed on the Buttermilk Fried “Boneless” Chicken & Waffle and the Tavern Sliders Trio Platter, which comes with one each of an Angus Burger, a Buttermilk Chicken and a Maryland Crab Cake slider. 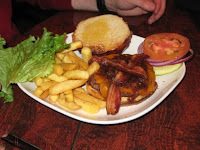 Robert was championing the Hot Kentucky Brown sandwich, and we got that as well. 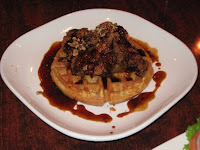 When we got our Buttermilk Fried “Boneless” Chicken & Waffle ($15.99), we discovered the reason Jack Gage puts quotes around boneless is that each of the dual breasts had one weird extraneous bone jutting out. Topped with a sweet pecan bourbon maple glaze, it tasted good, but we were left a little baffled as to why the dish demanded such a hefty price tag. They didn’t church up the chicken and waffles that much. 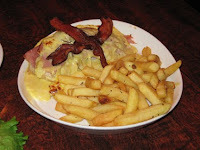 As for the Kentucky Hot Brown ($7.99), this one was thoroughly underwhelming -- nothing more than an open-faced club sandwich, loaded way past the breaking point with a Swiss cheese glaze that was more like a heavy sauce. Side effect: Impromptu cheese fries. Now that, I did enjoy. One thing I noticed on the menu is that they do love to add crabmeat to dishes here -- witness the Eggs on Crab Hash ($13.99), and for an upcharge you can have a couple of the steaks topped with crabmeat. I actually do really want to try the Tavern Crab Mac & Cheese. Made with nine cheeses, it sounds fantastic. On Fat City, Ferruzza and Jonathan Bender rated it the #1 mac and cheese dish in town. The thing is, it’s $15.99. Do I ever need to pay $15.99 for macaroni and cheese? Could be great, but the Official Lunch Blog Position (OLBP™) is that mac and cheese performs best as a side dish. It’s not a main event. One scoop is plenty. How about a side portion or a half-order? Come on, Jack Gage. Help us out here. Maybe that’s why my parties keep getting seated in the back room -- they don’t want us mingling with the crab-in-everything aristocracy. Ferruzza describes the tavern’s namesake as “a scrappy fight promoter -- a carny, really.” Considering that reputation, I wonder where Jack Gage himself would be seated?